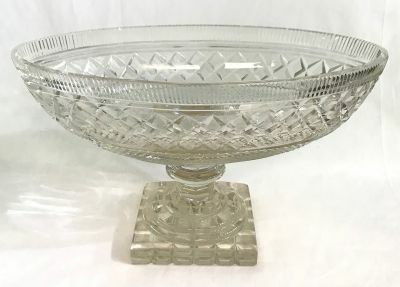 Georgian Anglo-Irish cut glass footed oval compote , early 19th century. There are three horizontal bands of cutting. The top band has vertical fluting, the middle band has cross hatching on a larger block, the lower has smaller cross hatching. On a stepped baluster stem on a square base. 13 1/4” by 7 1/4”, 7 1/2” high.